I started a new "thing" at work. Simply, I bake muffins on Sunday afternoon, then bring them to work on Monday to share with my coworkers. 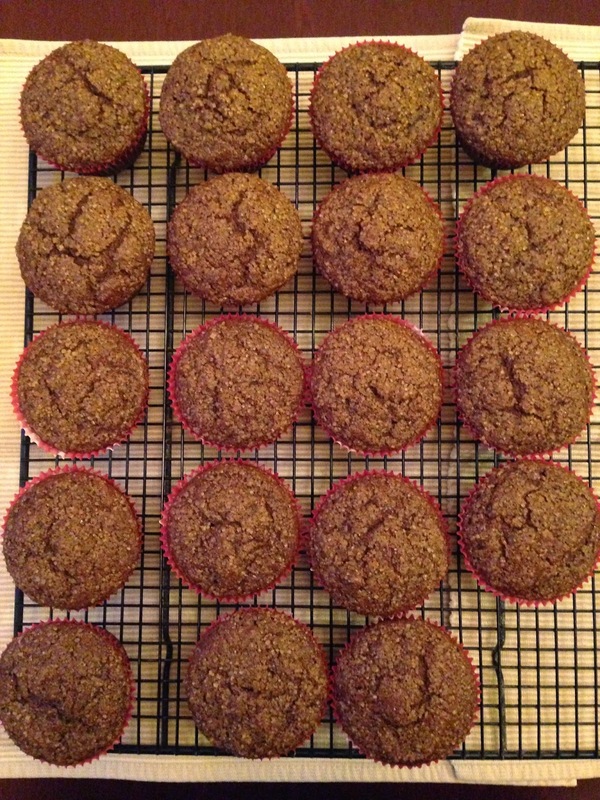 I've received many thank-yous from folks, and even more comments about my generosity -- some people have been downright shocked that I would bake muffins and give them away every single week. I don't do it for them ... I do it for me. I LOVE TO BAKE. Always have, for as long as I can remember. One of my favorite childhood photos of myself was taken at about the age of three, standing at the kitchen counter, helping my dad knead bread. Baking is in my bones, people. It's who I am. I love nothing more than to whip out the flour and eggs and sugar and mixing bowls on a Sunday afternoon, filling the apartment with delicious smells ... and enjoying delicious treats later. I also love to try new recipes and new flavor combinations, and welcome any opportunity I have to experiment in the kitchen, whether it is by baking, cooking, or canning. Wee! However, I alone cannot keep up with consuming the quantity of baked goods I love to produce. So, that's where my coworkers come in. 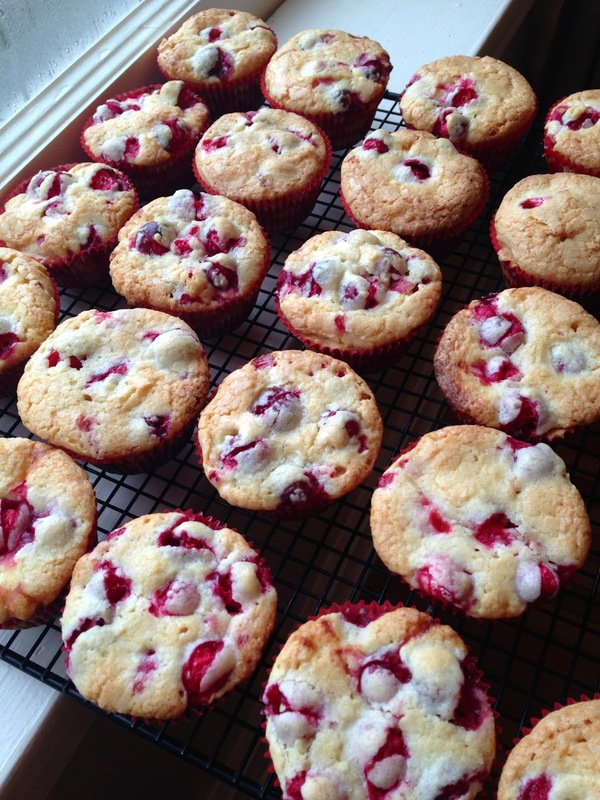 Thanks, all y'all, for helping me eat all of the muffins I've baked. I'll keep it up, if you'll keep eating them! 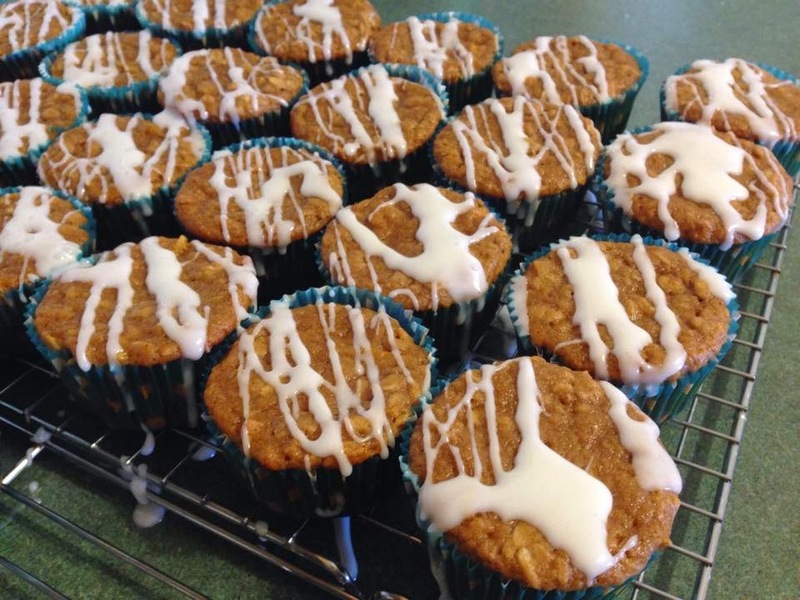 So ... any favorite muffin recipes to share? What should I make next week? While I love a glass or two of eggnog around the holidays, I never can seem to get through a whole quart on my own. (Why don't they sell eggnog in pints anyway? It would make more sense for me, and also act as a single serving for others, I assume!) 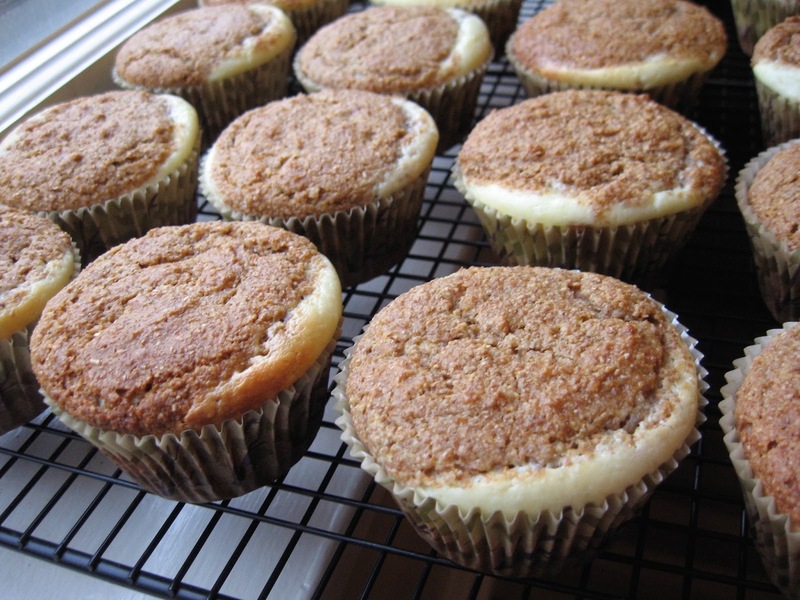 I made eggnog doughnut muffins, sipped a couple of servings, and made a few eggnog lattes, but still had quite a bit left ... until I discovered eggnog oatmeal! Rich, creamy, sweet, and subtly spiced, eggnog oatmeal makes a comforting, quick, nourishing breakfast during the busy holiday season. Combine the eggnog, water, and salt in a small saucepan, and bring to a boil. Stir in the rolled oats, lower the heat, and continue cooking, stirring frequently, until the oats are cooked and the oatmeal is thick, about 5 minutes. Top with dried cranberries and grated nutmeg. What are your favorite uses for leftover eggnog? I've reached the moment in time where I have made peace with the fact that my iPhone takes better pictures than my 10-year-old Canon point-and-shoot. Sigh. I made a huge tray of cookies on Monday to take to work, and tried taking pictures, and they were just ... awful. (Darkest day of the year certainly didn't help!) So this year, instead of viewing the entire spread, you get a shot of my "snack plate" that I fixed for myself today, for periodic nibbling in-between meals, walks, knitting, reading, laundry, and maybe, just maybe, a nap. (Because I got home from singing for Christmas Eve service well into Christmas Day last night!) Merry Christmas! Cookies after breakfast? Yes, please! I have made this recipe several years in a row now, and they have become a mainstay. I love gingersnaps, and I love them even more when they are chewy (and STAY chewy several days later.) Gingersnaps are one of those cookies I believe are actually better a few days after baking ... maybe it's that whole "flavors having a chance to blend" thing? Anyhow, these are great -- nicely spiced, but not "too spicy." A cookie for adults and children alike. 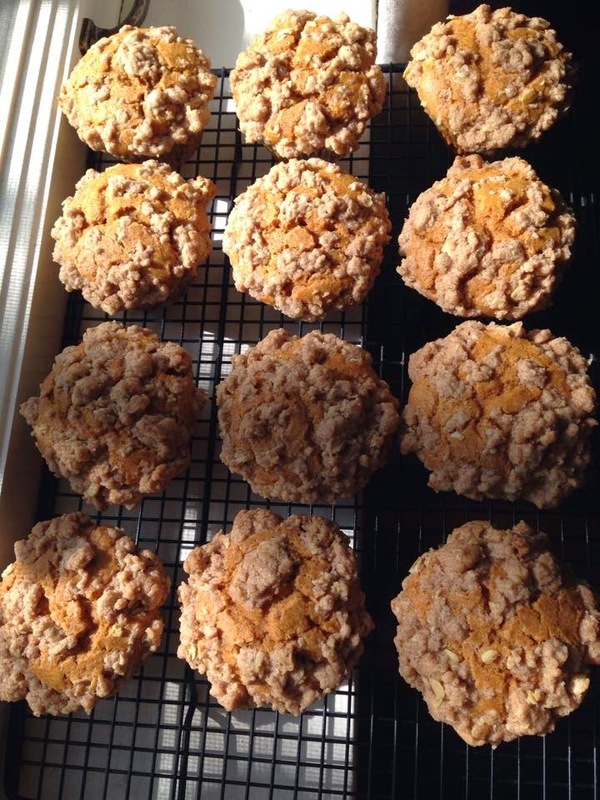 I used coconut oil this year (instead of the canola oil called for in the recipe,) and they are perfect. This fall, I had a peanut-butter stuffed chocolate cookie at a local restaurant, and fell in love -- I HAD to find a recipe! King Arthur Flour to the rescue! I strayed from the original recipe a bit, adding an ounce of Neufchatel and a tablespoon of milk to the chocolate dough, (recipe reviewers complained the dough became dry with storage,) and ended up having to add a few teaspoons of milk to the peanut butter filling (using natural peanut butter made the filling a bit dry and crumbly.) These weren't nearly as fussy as I thought they were going to be to shape, and have been a huge hit with friends and coworkers. My friend Dora told me, as she dropped me off after church last night, that "the chocolate cookie with the peanut butter surprise" was the best one I made this year! They were the first to go off the tray at work, too. Thank you, Faith Durand and The Kitchn, because these are, hands-down, the BEST cut-out sugar cookies I have EVER HAD. The dough is a dream to work with, froze beautifully, and yielded soft, yet sturdy cookies. I also love that the additions of both lemon zest and almond extract make the cookies themselves more of an event, rather than just an avenue for buttercream and sprinkles. :) Decorated sugar cookies are always my favorites, and these have elevated what I've come to think of simply as "Christmas Cookies" to a whole new level. Another Kitchn recipe I tried this year, and a good one. For a few years growing up, we made a cookie called "Peppermint Snowballs," which I believe may have been a grandparent to these bars, and Peppermint Snowballs were always a favorite of mine. I don't love chocolate, although I LOVE mint, and I fell for the buttery shortbread and minty cream filling instantly. However, we gave up on those cookies after a few tries because they were too fussy and just didn't store well. 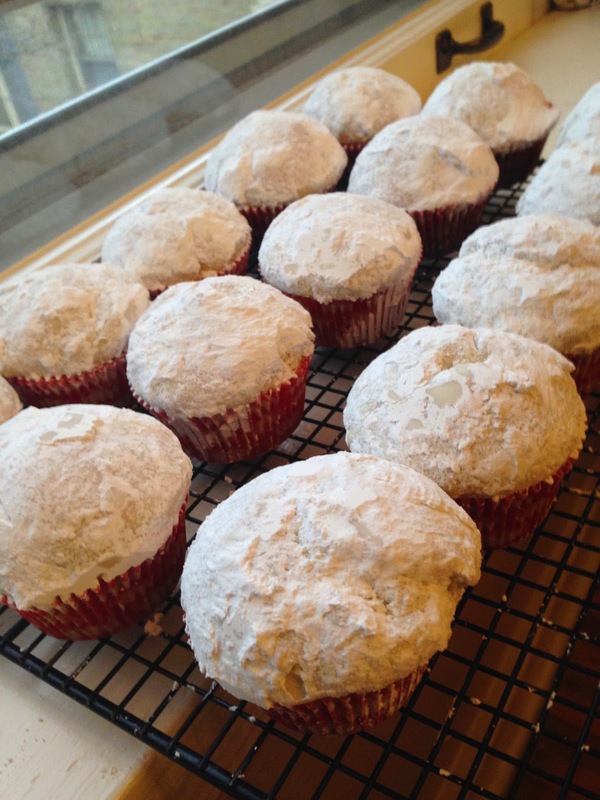 I was thrilled to find this recipe, because I missed the flavor of Peppermint Snowballs, but not the fuss and mess. Bars to the rescue! I made a few changes to the published recipe, (including using all of the shortbread as the crust and simply sprinkling the peppermint/powdered sugar over the warm cream cheese layer,) but may even make more changes next year. I wanted a slightly thicker, more cheesecake-like peppermint layer on top, rather than the more moist, sticky layer I got using the original recipe. I think I will increase the cream cheese and add an egg next year. Regardless, these have still been hugely popular ... people who love shortbread and mint were coming back for seconds! These babies are unassuming at first glance, but folks who are brave enough to try them are richly rewarded. I think people either love or despise figs; I am a lover of figs, both fresh and dried, and consequently, LOVE these bars. (Plus, hello lemony cream cheese topping!) A day after delivering tins and gift bags of cookies, I received a text message from my friend Stephanie: "It's like a fig newton but better! Yummmm." Agreed. I follow the recipe as printed, baking the bars in a smaller 8- or 9-inch square pan, rather than the 9x13 called for. This is another one of those frequent repeats, as I get several "are you making the lemon cookies this year?" requests, again beginning at Thanksgiving. One of my work friends reported these were her husband's favorites, and I "caught" at least one coworker rushing back for seconds of this one just moments after returning to his desk with his first selections from the tray. I decided rather than toss out the surplus glaze this year, I would simply double-dunk the cookies. More sugar! Yes. Off to eat a post-breakfast cookie now. Merry Christmas! I did it again -- I conquered a ridiculously long Christmas cookie and candy baking list in one day. Typically, I do this every year the weekend before Christmas, and this year was true to tradition. I love to bake, I love to share the variety of treats I make with friends and coworkers, I love the opportunity to try out new recipes, and I love tackling the challenge of a big baking day. To some, a big baking day, (or any marathon kitchen day, for that matter,) seems daunting and sort of crazy -- like, why would anybody want to spend 10+ hours in the kitchen covered in flour and sugar? It is intense, but totally worth it, in my opinion. Why, you ask? Second, you only have to break out the big guns once. Dig out and clean up those rarely used kitchen items like the 9-inch silicone pan, electric mixer, large storage containers and platters, rolling pins, cookie cutters, sprinkles, food coloring, batter bowls, and removable-bottom bar pans. Get them out, use them, clean them, then stash them away again until next time. Done! One day of digging in the back cupboards and climbing around on the step stool, and then you can say good-bye to those items for a while. Third, you only have to clean up once. Now, don't get me wrong -- my kitchen is the size of a postage-stamp and I don't have five sets of mixing bowls, so I probably did four (five? six?) sinks of dishes during the course of the day yesterday. However, the state of my kitchen floor today? EEEEEEEEEEEWWW! Sticky, crunchy, grimy, and who knows what else. That just happens, you know, when you make that many treats in one day. And that's okay, because today tomorrow (ahem, cough, cough,) I will sweep, mop, and wash the rug, and all will be right with the universe. :) However, if I had stretched my baking out over a week or more, I would have had to live with that disgusting floor for days on end, or I would have had to mop multiple times. Neither option sounds good if you ask me! Last, I really enjoy the challenge. My brain loves to plan, organize, multitask, and tackle large projects as efficiently as possible. And after several years of pre-Christmas baking marathons, I've discovered a few tips, tricks, and hacks that have been game-changers -- changing the marathon from something dreaded, disorganized, and stress-inducing to something exciting, challenging, and fun! 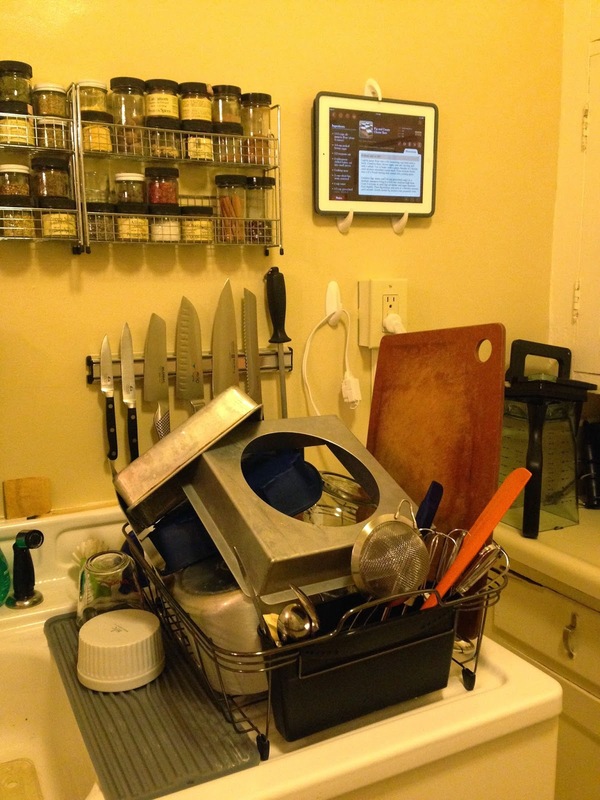 Clean dishes, and my iPad mount hack. Bless you, 3M, and your Command Adhesive. Be Prepared: Several days, or even a week before your marathon kitchen day, pull together all of your recipes, make a shopping list, and check your cabinets to see what you have on hand. When I do my big baking days, I don't simply write "butter," "flour," or "eggs" on my shopping list ... I do the math and write "5 lb butter," "12 c flour," "9 eggs" etc. on my shopping list. I also recommend double-checking your stock the day before baking day, just to make sure. (Because, you know, I didn't buy enough cream cheese last weekend, and would have ran out yesterday had I not double-checked!) Running out or missing an ingredient when you are in the midst of a marathon kitchen day is the WORST. Check on things like spices, vanilla, food coloring, sprinkles, even salt ... things you always assume you have on hand, but may actually run out of from time to time! Prep as Much in Advance as You Can: Take a look through your recipes and figure out what you can do ahead of time that will save you time and help you be more efficient during marathon day. This year, I made both candies last weekend, (because candy keeps infinitely longer than cookies do,) and prepped and froze three of my cookie doughs. Thursday night, I pulled the doughs out of the freezer and was ready to roll (literally ... ha ...) first-thing Friday morning. Wear Shoes: This may sound silly, but seriously ... your knees, hips, and back will thank you for wearing comfortable, supportive shoes at the end of a long day on your feet. My tendency is to wear socks or slippers around the house, but NOT on marathon kitchen days! Get Dressed: This may also sound silly, but getting dressed, even if in just jeans and a t-shirt, can be a game-changer for me, mentally. It would be easy to stay in PJs or sweats for marathon kitchen days, especially since I don't typically leave the house on these days. However, getting dressed tells my brain it's time to wake up and get down to business. Getting dressed helps me feel sharper and more focused. Since I am tackling so many projects all at once, I need to feel as sharp and focused as humanly possible! First Things First: Before I even made my coffee yesterday morning, I took ALL of the butter, eggs, and cream cheese I needed for the day out of the fridge, allowing them to come to room temperature. Nothing "bad" happened to those things while sitting out at room temperature for the day. Think about little tasks you can do RIGHT AWAY that will make your life easier in a couple of hours. Then, after I had my coffee and my breakfast, I preheated the oven and took the first cookie dough I needed out of the fridge, so they could both warm up while I got dressed. So basically, think ahead a little bit! Clean Before You Start, and Clean as You Go: Make sure you wash up any breakfast dishes and do a quick wipe-down of the counters before you get started. (Nobody wants cat hair or toast crumbs in their sugar cookies. Just saying.) Remove any and all clutter from the kitchen you can -- give yourself as much workspace as possible, 'cause you'll use every square millimeter. Also, run a sink full of hot, soapy dish water immediately, so you can drop in sticky, dirty dishes as you go. (And as your dishwater cools and becomes greasy? Dump it and immediately run a new sink full!) When you find yourself with a few idle minutes, wash a few dishes. When you find yourself with a few more idle minutes, dry and put away a few dishes. Notice that the counter is cleaned off? Give it a quick spray and wipe, even if you're not done working for the day. (15-minute old spilled molasses is a LOT easier to clean than 15-hour old spilled molasses. You know.) Keep this up throughout the day. Run the dishwasher (if you are lucky enough to have one) when you sit down for lunch, then empty it before you dive back in. The clean-up becomes much less overwhelming if you can tackle it in fits and spurts throughout the day. Do the Complicated, Fussy Stuff First: Pick the trickiest, fussiest, most complicated projects on the list and tackle those first, while you are fresh. Do the projects that require the most brain power when you have it. :) 9 am yesterday? Tons of brain power. 7 pm yesterday? Mush. So, what survival tips would you add to this list? WHY do I do this to myself every single year? I get way too ambitious with my holiday baking, find way too many new recipes I want to try, and end up with a "to bake" holiday cookie list longer than my forearm. Both a little ridiculous and a lot impractical, I need to pare the list down, STAT. What would you cut? What would you keep?